Thirteen-year-old Natalie Minks loves machines, particularly automata--self-operating mechanical devices, usually powered by clockwork. When Jake Limberleg and his traveling medicine show arrive in her small Missouri town with a mysterious vehicle under a tarp and an uncanny ability to make Natalie's half-built automaton move, she feels in her gut that something about this caravan of healers is a bit off. Her uneasiness leads her to investigate the intricate maze of the medicine show, where she discovers a horrible truth and realizes that only she has the power to set things right. 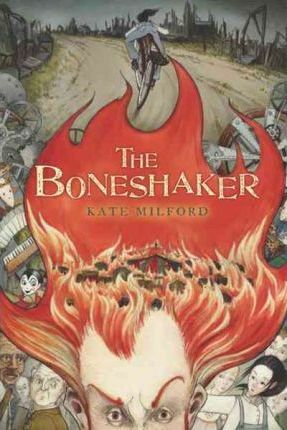 Set in 1914, "The Boneshaker "is a gripping, richly textured novel about family, community, courage, and looking evil directly in the face in order to conquer it. ""This unusual story, with elements of folklore, tall tales and steampunk, has rich details of small-town America in the early 20th century as well as the impact of budding technology. Natalie is a well-drawn protagonist with sturdy supporting characters around her. The tension built into the solidly constructed plot is complemented by themes that explore the literal and metaphorical role of crossroads and that thin line between good and evil." --"Kirkus Reviews"